Stuffed Date Fritters remind me of Ramdhan spent in Abudhabi, UAE. 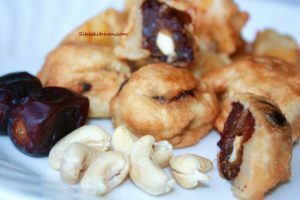 When Ramdhan falls during July-August, you get different varieties of dates from the farm that are sweeter than honey and give you a jump start while breaking a day long fast from dawn to dusk. Some Arab farm owners may gift you few kilograms of dates just for visiting their farms. 1.Pit all the dates by slicing along one side of it and stuff each one with raw cashewnuts. 2. Now prepare a smooth thick batter with rest of the ingredients. 3. 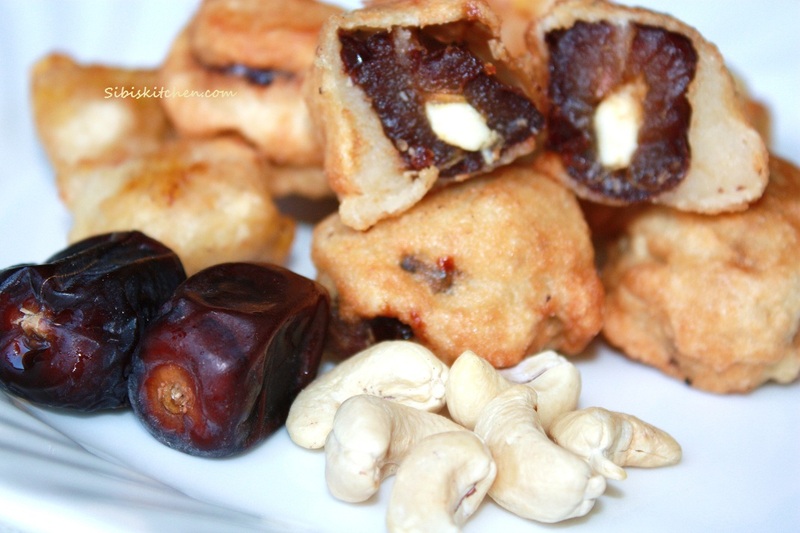 Heat oil in a pan and dip the stuffed dates in the prepared batter and deep fry to golden brown.